This is a Workshop addressed to those who have concerns with Media Art, Digital culture, Critical Economy, Electronics and Internet of Things (IoT). A theory part introduces concepts, examples, art-works and books in order to understand Bitcoin and the Blockchain world. The practical section proposes to work with a basic electronic circuit, welding and microcontrollers to build a playful bitcoin miner. The objective is to transform objects from daily life (E.g. Maracas, hammers or salt shakers) into Bitcoin miners able to connect to the blockchain, calculating a hash to try to get a reward of 12.5 Bitcoins. - Sensors and actuators like buttons, accelerometers, switches, photo-resistances, etc. The Bitcoin was conceived as an electronic decentralised system for capital transactions. Each node (user) had the same opportunities to get a reward when validating a transaction. In recent years, this system has triggered a competitive struggle in which computing power is the most important variable for earning Bitcoins. This involves the use of large equipment, computer farms spending physical and environmental resources. A dispute that benefits only the owner of the most powerful and efficient technology. Causing A BIG WASTE OF ENERGY!!!! Bitcoins of Things (BoT) transforms this “crazy” way of producing Bitcoins into a playful lottery. HOW!!!!? ?The Bitcoin mining process consists of finding a random number called “Nonce”, which is added to the Headerblock and through a Hash function returns a number (hash value) that, if it starts with a sufficient number of zeros (difficulty), can be validated by the Blockchain network. When this number is found a reward of 12.5 Bitcoins (approx 9000€) is earned by the miner. 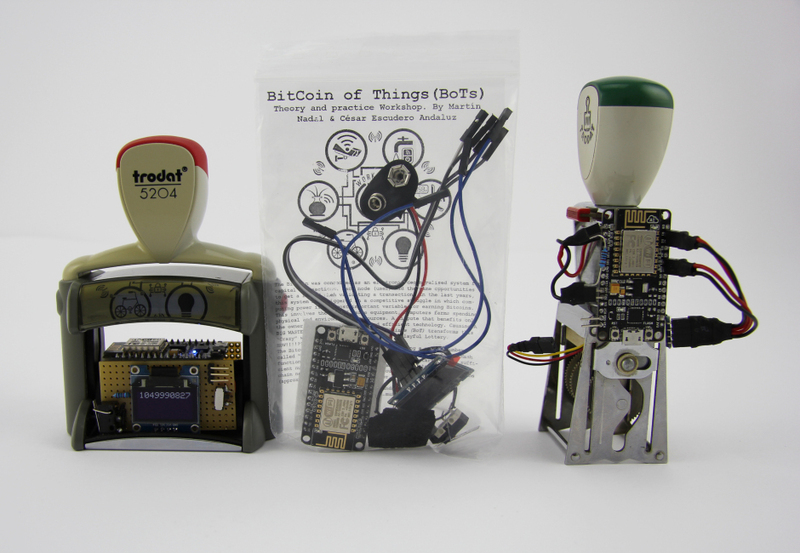 Participants will build a BitCoin of Things (BoT) miner combining a Wi-Fi microcontroller and different sensors such as an accelerometer, microphones or buttons, generating a “Nonce” from its reads to try to validate all the Blockchain pending transactions. The possibilities are lower, but it decreases the use of energy of the calculation processes, making it more sustainable. Finally, the microcontroller is attached to objects from daily life, like keyboards, computer mice or salt-shakers. When the objects are used, they can potentially generate large number of Bitcoins, playing with the idea of finding the philosopher's stone. some tools such as pliers, glue, scissors (some will be provided).